Forty years of liberal politics have failed miserably. Liberals and President Barack Obama blame conservatives. This country is in the final stages of “disintegration” despite whether anyone wants to acknowledge it. Our public education system is a failure, our economy has been trashed with runaway spending on more liberal theories that don’t work. The final insult is the polarization of society, which has gotten much worse under Barack Obama, whom we were told would unite us in a “post-racial” society. Wrong. As we circle the drain, cities like San Francisco, Los Angeles, and Chicago have the “new era” police chiefs: They sort of “look like” police officers, but they won’t enforce immigration laws, they appease Muslim terrorism, they hand out millions in failed programs to freshly-entitled low-income minorities, and they blame white people for…..everything. It’s not “post-racial,” this is the Obama “neo-racial” society. What are YOU going to do about it? Warning: The content and images are graphic. 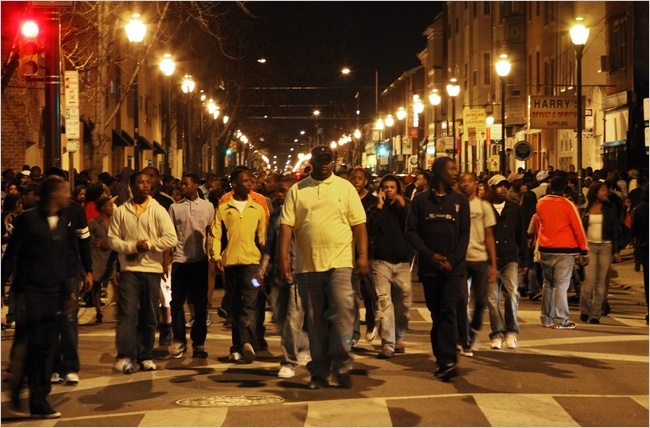 Mobs of BLACK PEOPLE are running wild in American cities preying on white people and businesses. You are called a racist if you report this fact. 8 blacks attack white teenager in South Carolina. Until recently, the hopelessly biased mainstream media were content merely to ignore, suppress, censor the race – not races – of these savages. (That’s “people who are savage.”) But censorship wasn’t enough. It couldn’t stop readers from seeing the photos. It couldn’t stop them from watching the videos. It couldn’t stop them from looking out their windows at the dark-skinned mobs rampaging outside. And it couldn’t stop the White victims from telling everyone they knew. That’s when readers started to complain. Oh, those complainers. I guess they don’t enjoy being beaten with bottles and baseballs – and fists and feet, of course – or sprayed with mace, then robbed of the things they bought with the money they earned working jobs – yes, jobs, something many Blacks just can’t be bothered with anymore. Stampeding over welfare application forms? Sure. But jobs? Not so much. Emergency responders on the 4th of July from Journal Star on Vimeo. Black mobs shot firefighters with fireworks at a housing project in Peoria, Illinois on Monday night during the finale of the 4th of July celebrations. A large-scale illegal fireworks display in a housing complex adjacent to the state’s largest Fourth of July celebration turned into what police termed a near-riot Monday as tens of thousands of revelers tried to filter out of Downtown. As the grand finale of the Red, White and Boom! event exploded over the Illinois River, emergency responders were called at 9:46 p.m. to a trash bin fire in nearby Taft Homes, where commercial-grade fireworks had been shooting into the sky since before the riverfront show began. A fire engine and two Peoria police officers responded, but encountered what police described as a crowd of hundreds of people and an impassable Hancock Street choked with trash and fireworks – both live and spent. The debris blocked access to the burning trash bin. Police at that point began ordering the crowds to disperse, and firefighters hosed down the live fireworks and smoldering remnants of spent shells. That’s when mortar-type fireworks began firing toward and exploding near the officers and firefighters. Some people also hurled bottles and rocks, according to police. “The truly frightening thing about this is the mentality. These people are fighting and brawling with each other randomly, just for the sake of doing it. They don’t know each other. There is no gang delineation here – there are no “colors” lined up against each other. These people are beating the crap out of each other simply as a means to entertain themselves. This is FUN for them. It is violence for violence’s sake. After discussing psychopathy and the inability to feel any empathy for other human beings, and viewing of other people as nothing more than animated objects, you can see why this is so dangerous. These people demonstrate an animalistic consciousness. History has shown that tyrants, Marxist and otherwise, use and encourage this animalistic culture, channeling mass psychopathy into a directed enforcement arm. And yeah, I used the term “animalistic” without hesitation. You want to call me a racist? Go right ahead. But remember that we saw this same animalistic behavior last week in Vancouver. We also saw it in Nazi Germany and the Soviet Union. We also see it in China and North Korea. It has also been seen in Japan and Southeast Asia. We also see it today among the narco-gangs in Mexico, Central and South America. Oh, and don’t forget how we see this animalistic behavior throughout the entire muslim world. So, if I’m a racist, my question would be, WHICH RACE? Because I’m pretty sure that I just covered all of them.